I doubt I am alone among you, dear readers, for my great fondness for The Carnival of the Animals suite by Saint-Saëns and it is probably quite unnecessary to explain to most of you that this suite consists of various amusing movements inspired by a broad assortment of animals, culminating in a final triumphant march of all the animals together: lions, kangaroos, hens and cockerels, swans, the creatures of the aquarium, birds, fossils, tortoises and so forth, marching together in a display of unity rarely seen in the animal kingdom. As I went about the garden picking flowers to use them up before a trip we went on recently, I couldn’t help drawing a parallel with the animals’ final march and my vase of oddments, a grand summer floral finale, and a random assortment of flowers if ever there was one; flowers that are most unaccustomed to marching together to the same tune; at least, not in my household. For example, I would not usually use quite so many shades of pink, and then shove in a lone ‘Café-au-Lait’ dahlia, and then cram in as much cerinthe as possible along with some wild strands of sweetpea and a dash of orange marigold. The vase doesn’t know whether it’s coming or going, whether it’s wild or formal or cute or simple or flamboyant or what. Given that the Carnival includes among its menagerie of animals some fossils, some pianists practising their scales, and some ‘Characters with Long Ears’ (thought to represent music critics), it is only fitting that I included some non-flowers in my Carnival of Flowers; hence the bunch of lemon verbena that I picked for my sister, and a cup of tea. N.B. many of you who are acquainted with Instagram will be aware that it is mandatory to scatter cups of rapidly cooling beverages throughout one’s grid. In a Vase on Monday is hosted by Cathy at Rambling in the Garden, whose significantly more harmonious vase is full of many types of Persicaria this week. 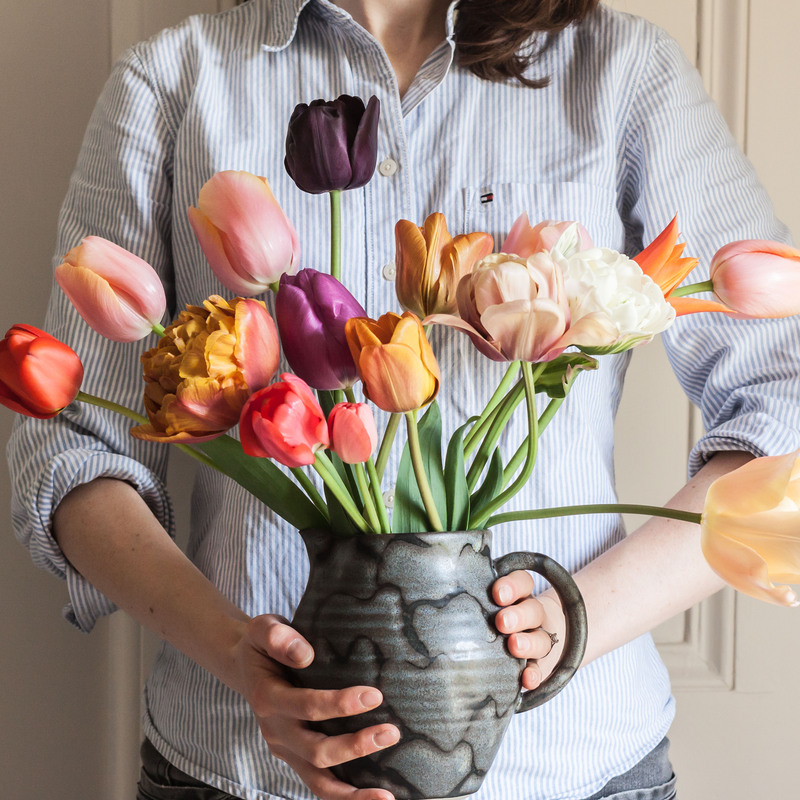 I do recommend visiting her page to admire them, and to find links to many other vases created by garden bloggers across the world today. As for this vase of flowers, it was donated to my sister who politely declared it to be ‘very pretty’. She is much more interested in edible plants than in flowers so I expect she has tried eating most of the petals by now. Being a musician, and an animal lover, I love Saint-Seans’ Carnival of the Animals! What a lovely bouquet for your sister…it is very pretty! A lovely mix, Joanna– per usual, your photos are delightful. absolutely precious! I love your carnival of flowers! A rare and beautiful carnival. I love it, and a clever comparison too. You describe this as ‘a random assortment of flowers’ but it’s just the kind of arrangement that I love (I often pick whatever is blooming in my garden). Your flowers work beautifully together and your photographs are lovely (gorgeous light). I couldn’t help but chortle at your IG comment – many accounts are a bit too ‘staged’ for me. I know what you mean about ‘staged’ although I’m guilty of that myself (it’s too fun, I can’t help myself)… unsubtle advertising in certain accounts is the biggest killjoy for me. I love your carnival of colours. As for D. café au lait, it looks edible. Well, I hope your sister survived the floral delight. I like it! We have a Cape Town cellist and composer, looks a bit like Stephen Fry – I once saw a live performance – Allan Stephenson’s delight in being an elephant was magical. So many years ago and I still see his grin!